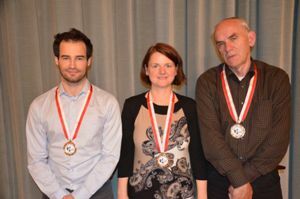 The 114 Individual Swiss Chess Championship took place from 27th September to 10th October 2014 in Bern, the capital of Switzerland ranked among the world’s top ten cities for the best quality of life. GM Yannick Pelletier won the event with 7/9 points and lifted the trophy for fifth time after winning the Swiss Championships in 1995, 2000, 2002 and 2010. Second place was split by IM Roland Loetscher and GM Vadim Milov on 6,5 points, but Loetscher prevailed on a better tie-break score. The silver medalist fulfilled his first GM norm playing at ELO performance 2630 and adding 26 ELO points to his rating. The former World champion for women GM Alexandra Kosteniuk took clear fourth place with 5,5 points, followed IM Nico Georgadis (4,5/9), IM Martin Balamnn (4/9), IM Markus Klauser (3/9), IM Oliver Kurmann (3/9), IM Beat Zueger (3/9) and IM Andreas Huss (2/9).